The Photo Gallery - I made this! Week 150 - I made this! I really didn't know what to pick for this week's theme. I have made many things I am very proud of, not least my children! However, I don't seem to have much time to make things when I am at university. I am very good at making a mess. A lot of mess. Generally when decorating, which I have done a fair amount of in this house. There is also a lot more mess to come! The end result tends to be pretty good though and definitely worth the mess. 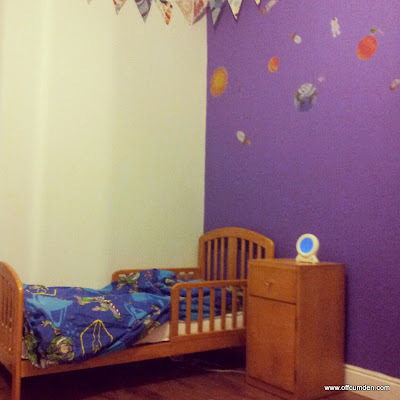 This is the boy's bedroom. He chose the colours and the stickers, I simply did the hard graft, making a mess, sanding and then painting again! I make a decent amount of bunting, it seems to be one of the things I am good at! We have Happy Birthday bunting and Christmas bunting. The Christmas bunting I made this year and it looked fantastic in our living room. 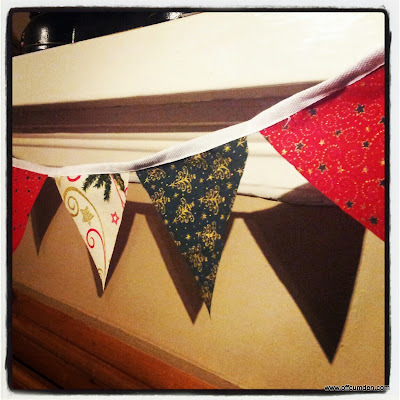 I also made mini Christmas bunting, which hung on our mantelpiece in the kitchen. The most recent thing I have made is fitted blackout blinds for the children's bedroom. They fit perfectly to the windows and are totally made to measure. On one side is blackout material and the other side is a cool spotty fabric. They stick to the window with velcro, so they can come off and on as many times as you like. I am very proud of them, but haven't actually got a picture! I am one of those people who realises they need something, look at the ones currently on the market and then make my own! Once I put my mind to it, it doesn't take long to come up with a finished product! I only wish I could say the same for my essay writing skills! To see what others home up with for this week's theme, click on the image below.